Since there has been a lot of interest in this product, I'm breaking the review into two parts. This First Look provides an overview of the product and internal details. It also covers wired routing and storage performance test results. The second article covers wireless performance and adds in some stress testing, for good measure. The CENTRIA is a simultaneous dual-band three-stream N router, which is more commonly marketed as an "N900". This is because it can support client link rates up to 450 Mbps on both radios simultaneously if the radios are set to Auto 20/40 mode (NETGEAR calls this Up to 450 Mbps mode) and there are no competing networks in range on the 2.4 GHz band. CENTRIA comes in two flavors—the WNDR4700 without an internal drive installed and the WNDR4720 with a 2 TB drive installed. The FCC ID internal photos show both WD Green (WD20EARX) and Seagate Barracuda (ST2000DM001) drives, which I'm guessing are what NETGEAR uses in the diskful CENTRIA version. 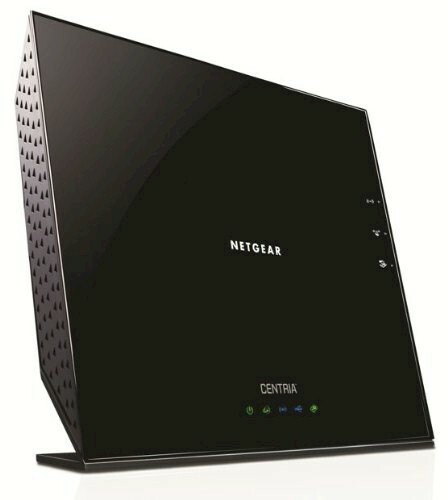 CENTRIA's physical design shares a lot with NETGEAR's R6300 draft 11ac router, measuring around 10 inches wide and a bit over 8 inches tall. The CENTRIA is a bit deeper than the R6300 (3.3" vs. 3.0"), however, to leave space for the full-sized 3.5" SATA drive it can store internally. There are only Power, Internet, Wireless and USB and HDD status indicators on the front panel and no link or activity indicators for wired network traffic on either the front panel or rear panel switch ports. This move to no network activity indicators may increase the CENTRIA's WAF, but it is no help when it comes time to debug network problems. All ports are 10/100/1000 Mbps and there are two USB 3.0 ports--one on the rear and the other on the right side. And if you still don't have enough storage options, NETGEAR has also included an SD card slot. This should prove handy for quick digicam backups and moving media files to Android tablets and phones. Also like the R6300, CENTRIA is intended to sit on a table on its non-removable base with all Ethernet jacks on the bottom edge so that there is no danger of the router being pulled over by cable weight. The recessed area is still fairly narrow and fat-fingered folks may wrestle a bit with cable insertion and extraction. As there was when the R6300 first shipped, there is no user manual for the CENTRIA as I write this. There is an install guide, however, which should tide you over until NETGEAR posts the UM. NETGEAR is sticking with the "Genie" admin GUI first seen last fall on the WNDR3800. The screenshot below shows the Advanced Home page that, with the addition of Guest Network Status boxes, has sprouted scroll bars. I really wish NETGEAR would stop doing this and let us scroll the browser window to get to stuff that doesn't fit on a broswer page. The screenshot shows the defaults that the router came up with, except that I let it upgrade from the V1.0.0.28 initial release factory firmware to the V1.0.0.32 shown. I was alerted to .32 by the CENTRIA's automatic update feature; the CENTRIA support page is still showing only V1.0.0.28. I'm not going to review the CENTRIA's routing features, since they are standard NETGEAR Genie. If you need a walkthrough on the Genie feature set, Craig's feature review of the WNDR3800 should give you what you need.